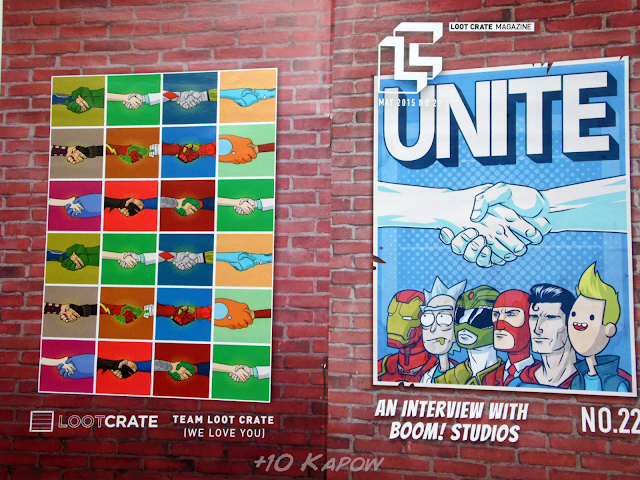 The May Loot Crate theme was Unite and look at how awesome that cover is. I'm still waiting for the day that Loot Crate announce that their artwork will be included each month as a poster, I'd love both of those images as prints. 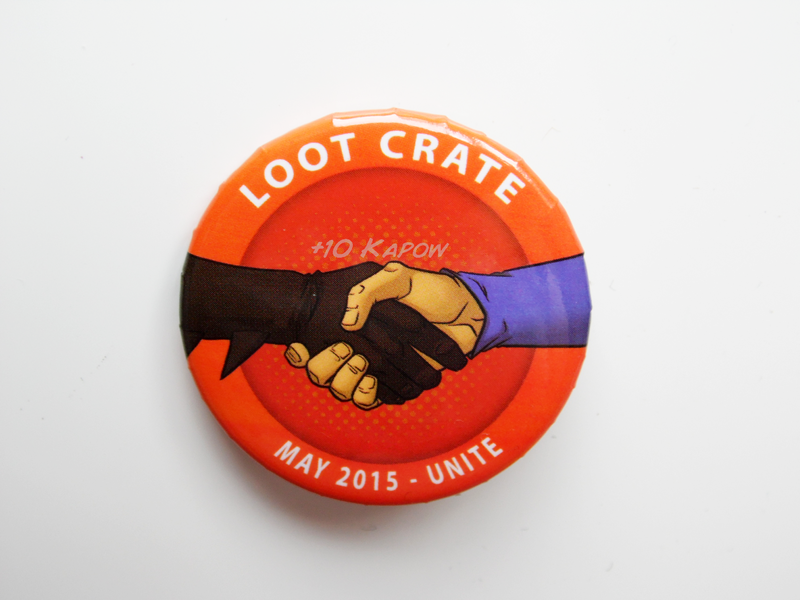 Awesome badge as usual, but I'm going to move onto the items in this month's crate. This was a pretty awesome crate, I fail to ever be disapointed with Loot Crate, each month the items make me squee and this month is no different. 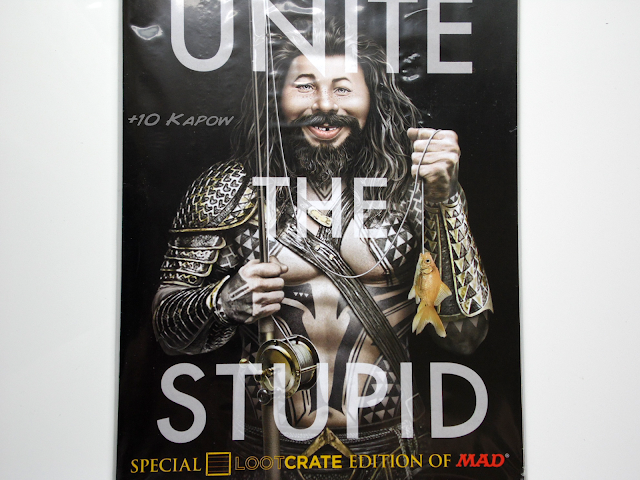 I think I may be a Loot Crate fangirl, is that a thing? Anyway, looook!! Any month that has a t-shirt is a good month. I'm a little bit of a t-shirt addict and I friggin' love this one, the colours are a little bit more muted than they are in the photo and it will definitely get a lot of use. Ooooooh, it says car decal but I'm going to disregard that, I'm pretty sure it will stick anywhere and I'm probably going to put it on my laptop, I've currently got the Tetris stickers from a previous crate in the shape of a heart so I'll shimmy that across to one corner and have this in the middle. These will probably be snagged by Jim. I have never played Team Fortress 2 but it has always been a game that I have wanted to try, now that I am getting into PC gaming a bit more, I might add it to the list of games to try out, then I'll steal the pins back off Jim if I like it, haha! Like t-shirts, any month that contains are comic is a great month. 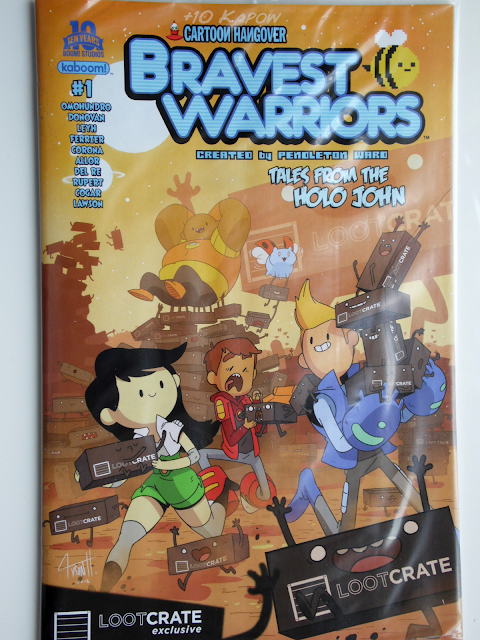 Not massively into Bravest Warriors but Ki will love it. Love! We eat mostly fresh food so our freezer is always filled with ice cubes and ice cream and that's it. We currently have Lego bricks and people moulds, Star Wars Han Solo, Stormtroopers and Millennium Falcon moulds in our nerdy ice cubes freezer section so this is just another awesome add to that. Plus, amazing for making chocolates! I've heard of MAD magazine, it's been referenced in some of the TV shows I watch. I've never read one but with that content, I'm sure it will be a good read when I get round to it. Awesome! That is all! I have put these in my British Knights hi-tops already and they are pretty long, not all-the-way-to-the-top long but still adult-sized-long. They are awesome, although I would have preferred the colour version but I do love these ones too. Jigsaws are fun, novelty jigsaws are funner. I'll probably do this once and then give it to Ki, I'm sure he'll get more enjoyment out of it anyway. Twas an awesome crate this month, I'm pretty happy with all the items, price wise though, was it worth it? Let's have a look. 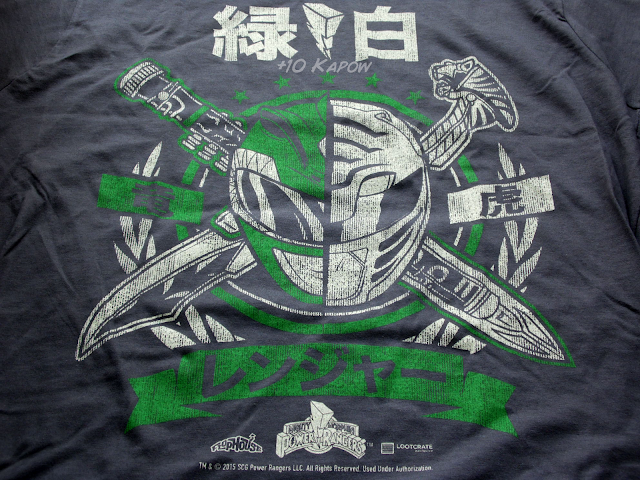 Green Ranger T-shirt- £15- this is a complete guesstimate, I looked everywhere and couldn't find a t-shirt price for any of the Flophouse t-shirts so based on the fact that the t-shirt quality is fantastic and based on other prices of similar t-shirts elsewhere, I'm going to stick with the £15. Avengers Car Decal- $5/£3.26- This is another guesstimate. I'm not having a good day of finding prices for things. 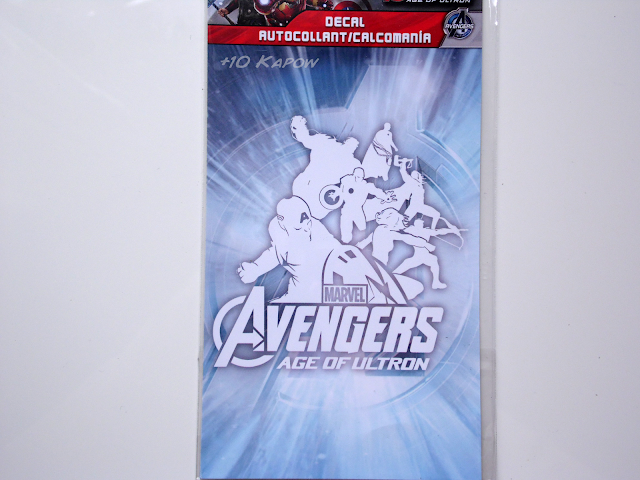 I thought maybe I could find this exact sticker because it wasn't an exclusive but no such luck, so I have based that price on similar styles of Marvel themed decals. Team Fortress 2 Button Set- £3-£5- Yup, you guessed it, this was another guess. Similar badge sets of branded items, like music, comics and movies sell in this price range so it's a good bet that's what these would cost. Bravest Warriors Comic- £3.99- This is how much I have been paying for new comics lately and so I would say this is an accurate price. 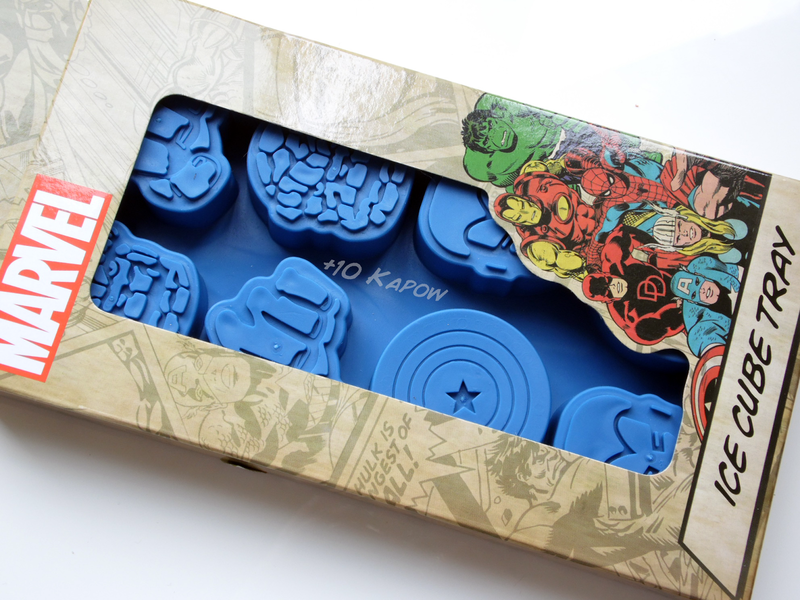 Marvel Ice Cube Tray- £6.50- I'm going by the US Amazon price for this because the UK Amazon says £15 which is an absolutely ridiculous price for an ice cube tray/mould. At least it's an actual price of the exact item though. MAD Magazine- $5.99/£3.91- Yay another actual price! 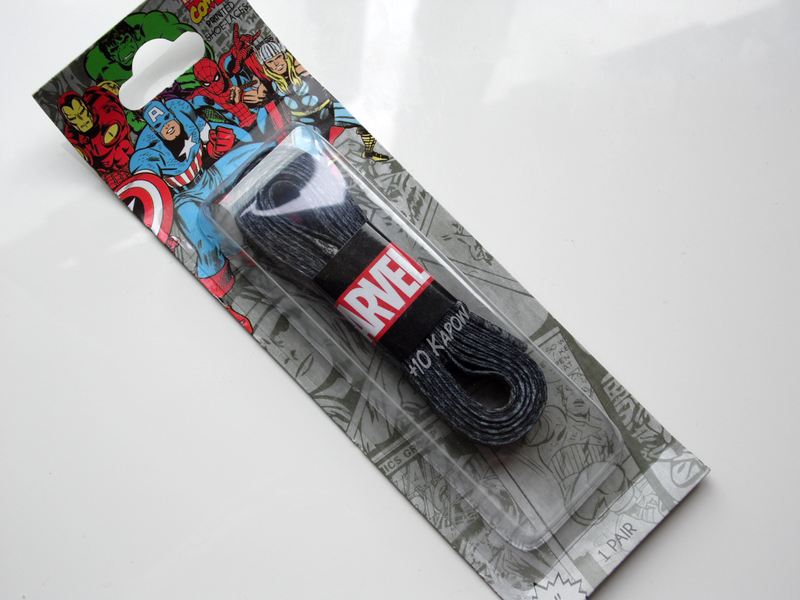 Marvel Laces- $7/£4.57- I couldn't find these either so here are other Marvel laces on US Amazon. Close enough! 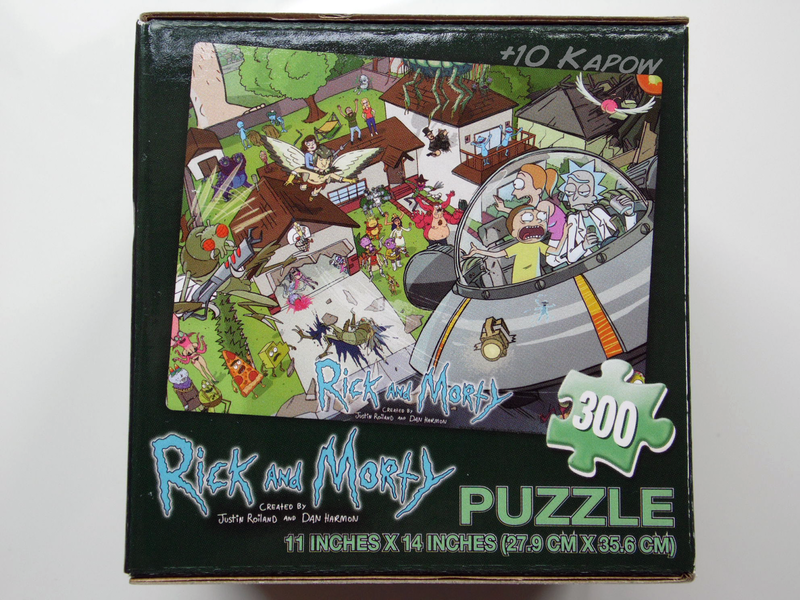 Rick and Morty Jigsaw- £8- yeah it's another guess based on 300 piece puzzles. Based on those prices, the Loot Crate comes roughly to £50 give or take and we pay about £18-£20 for the crate including postage. If you were to buy all the items at UK prices though it would all add up to a hell of a lot more. First time it has been this difficult to find prices, but I think it is pretty accurate, it's all just a guesstimate anyway, especially when there are a fair few exclusives and regardless of the price, you won't be happy with it unless you like the items. I won't lie, I ran out of spoons about halfway through this post, it's hard to write a post when you can't be bothered, I don't know how the proper bloggers do it all the time. So what do you think of this month's crate? If you are looking to sign up, you can go here, yes, this link, and sign up now to get next month's crate.